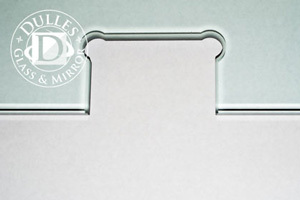 A mickey mouse cutout (pictured) is a precision cut made to your frameless glass shower door. Its unique shape, which includes rounded corners that resemble mouse ears, was engineered to provide greater structural security when hanging a heavy glass shower door. With a mickey mouse notch, it's virtually impossible to pull the door hinge out of the glass. Cosmetically, a mickey mouse notch provides a bed for the inner-workings of the door hinge, allowing it to fit flush with the door. 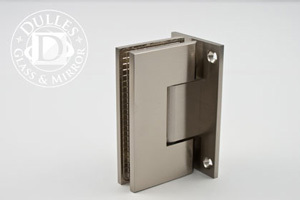 Finished cover plates tightly secure the hinge within the glass, preventing water or air corrosion from reaching the actual door hinge. Mickey mouse cutouts are used to secure both side hinges and pivot hinges.